Many patients who have Silver Amalgam Fillings are now looking to replace them with White Composite Fillings. The reasons for changing vary. In some cases it is for health reasons. In most parts of Europe (with the exception of the UK) Dentists are legally banned from using Amalgam Fillings and White Composite Fillings are used as standard. 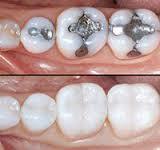 Amalgam Fillings contain Mercury, Silver and Tin. They are proven to cause health problems. Patients who are having Crowns and Veneers (also known as a smile makeover) are also replacing their silver fillings for cosmetic reasons as they are not noticeable when your mouth is open. A Composite Filling is crafted using a material of tooth-coloured plastic and glass mixture and is used to restore decayed teeth and close cavities. In 99% of cases our patients ask for White Fillings in place of their silver counterparts. In the first instance the dentist will numb the area before any treatment commences. If you have an old filling, the Dentist will remove your existing Filling and clean the cavity to ensure it is free from decay and infection. The Dentist will then start to apply the Composite material layer by layer. A blue laser light is used which hardens the composite material. As the layers start to reach the top of your tooth, the Dentist will use a tool to craft a shape which appears the same as your natural tooth. The Dentist will then check your bite and file away any of the remaining material which is not needed.